APPLICATIONS FOR 2019 SEMESTER ONE (February-June) INTERNSHIPS are now closed. Opportunity to attend events. Presenters allot time before events to answer intern questions. Training in event organisation, public speaking, debating and research. Opportunity to interact with expert speakers and with AIIA members, who have a wide range of experience in international affairs over many years. Access to a careers event, workshops and mentors from the public, private and non-for-profit sectors. Producing promotional information for events. Assistance in setting up and catering for events. Produce a minimum of two short opinion pieces (600-800 words) on topics of your choice to be published on the AIIA website (to be approved by the Intern Coordinator). Participate in intern presentations and debates. Promote AIIA events on the campuses of interns’ universities and through all available platforms, including social media. Candidates must be able to commit to the full duration of the internship, including availability on Tuesday evenings and a few additional hours weekly to complete research and administrative tasks. Awareness of and interest in international issues. Internship periods roughly coincide with the university calendar across two semesters (intakes). Semester 2 July – December. If you are interested in applying for an internship with AIIA NSW please send an email to nswinternships@gmail.com (for the attention of Michael Nguyen) containing a brief cover letter that addresses the Selection Criteria, your CV and a brief sample of written work (no longer than 3 pages). Please include contact details for two referees in your cv. Applicants should collate all documents into a single pdf attachment. The written piece should be analytical in nature and be on a topic of international affairs. The selection panel is interested in candidates’ analytical skills and their written communication skills more so than their particular subject-matter knowledge. Shortlisted applicants will be asked to attend in-person interviews. Unfortunately due to the volume of applications received, only shortlisted applicants will be contacted. Nicholas Conomos is a law student and Bachelor of Arts graduate in Philosophy and Modern Greek Studies from the University of Sydney. He is a former president of the Sydney University Greek Society. His research interests focus on the Balkans, Greece, Turkey and more broadly the politics of the European Union. Kevin Fine is in his first year of a Juris Doctor at the University of Sydney. He holds a Bachelor of Arts majoring in International Relations from Macquarie University and a Bachelor of Arts (honors), majoring in Government & International Relations from the University of Sydney. His interest in international affairs was stoked whilst undertaking a gap year program in Israel. Kevin’s main areas of interests are: U.S. foreign policy, international security, Israeli domestic politics and foreign policy, the Arab-Israeli conflict and Egyptian foreign policy. Hannah Green is currently undertaking a Master of International Relations at the University of Sydney. As a Deans Scholar during her undergraduate degree, Hannah majored in International Relations and Politics. While studying in Canada at the University of British Columbia, Hannah began to direct her studies towards international conflict management and post-conflict environments. She is currently a senior correspondent at the Organisation for World Peace and a project volunteer for the NSW Service for the Treatment and Rehabilitation of Torture and Trauma Survivors (STARTTS). 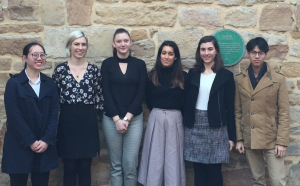 Hannah would like to continue to direct her research towards the promotion of more humane refugee policies in Australia and contribute to the creation of more effective humanitarian support for individuals in conflict and post-conflict settings. 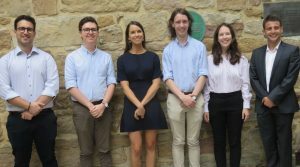 Alex McManis is currently undertaking an honours year for his Bachelor of Arts at the University of Sydney, majoring in Government and International Relations, and History. His thesis will focus on global environmental politics, particularly what influences states to take action on climate change. Alex previously interned at Ports Australia, the peak body representing the Australian ports sector, and was a pro-bono consultant for a Sydney tech start-up. In his spare time he is a passionate debater and has competed at the Australian Debating Championships, where he was an Octo-Finalist, and has judged at the Australasian and Australian British Parliamentary Debating Championships. Alex’s research interests include environmental politics, particularly global climate politics, democratisation and US politics. Euan Moyle is a second-year Master of International Relations student at the University of Sydney. He holds a Bachelor of International Studies from Macquarie University, and has also studied at the University of Geneva in Switzerland. Euan has previously served as an intern with the Lowy Institute, a research fellow with Young Australians in International Affairs, and was invited to participate in the 2018 United Nations Graduate Study Programme in Geneva. Currently, he serves as a geopolitical risk analyst with online publication Foreign Brief. His core research interests include Australian foreign and security policy, the Pacific Islands region, international development and human rights. Lucy Nason is currently a second year Juris Doctor candidate at the University of Sydney. She recently graduated from the University of Oxford with First Class Honours in History and Politics, where she focused on international relations and twentieth century political history. Having interned for a year at the United States Studies Centre, Lucy has a particular interest in US foreign policy in the Indo-Pacific region. She is also interested in diplomacy, public policy, and international law and has been a delegate to the Harvard Project for Asian and International Relations and represented Australia at the Global Future Problem Solving international finals.